With the disappearance of the US Airways code only a couple weeks away, you’d think American would be on lockdown in terms of making any other changes. You’d be wrong. Last Monday, September 21st, American reorganized how it parks airplanes at its Dallas/Ft Worth hub. Now, aircraft are being divided by type to try to improve operational performance. I spoke with Jeff Plant, VP of the DFW Hub to learn more. At first blush, this split may seem kind of strange. After all, why wouldn’t the A319s and A321s be in the same place since they’re the same kind of airplane? It’s not the type of airplane that matters but rather the size. See, the 757s, A321s, and 737s are all larger and take longer to load. They need more rampers and equipment to get them turned around. Meanwhile the MD-80s and A319s are smaller and require fewer rampers and less equipment. When gate changes occurred (and for American in Dallas, that’s pretty much constant), that made it harder to get the right people and machines in the right place at the right time. By devoting Terminal A to the bigger airplanes, American can make sure there’s enough staffing and equipment at each gate since each flight there will need it. Meanwhile, fewer resources can be located at Terminal C where it will constantly require fewer employees working on each flight. This also helps with crew connections. Previously, a crew might come in at one end of Terminal A and then have the next flight over at Terminal C, taking longer to get there and possibly delaying the flight if there was any delay on the inbound. According to Jeff, flight attendants are usually not switching between an MD-80 and, say, a 737 during each bid since they require different numbers of flight attendants to operate. So this means flight attendants will have shorter connections, making it easier to make up delays. Pilots, well, that’s mostly the case, but I believe the same pilot can fly the A319 or the A321. But for the most part, this will still speed up connections. This will also help with getting the airline off to a good start in the morning. They have a lot of airplanes they park on remote pads overnight, and then they gate them in the morning. Now they can position the 737s/A321s/757s on pads close to Terminal A and then the MD-80s/A319s close to C so they can all get on the gate quickly. It’s also going to help with bag transfers. Knowing that certain flights will always be in certain terminals, bag routings will be more predictable and easier to staff. This even has an impact on deicing. Jeff says that they need to do engine inspections on low-hanging engines when deicing is needed. These aircraft will be isolated better to allow personnel to stay in the same terminal. From a customer perspective, this means more predictability. If you’re starting or ending at DFW, you can at least know which terminal to park in if you know your aircraft type. And if you’re connecting, you’ll know with much greater reliability if you’ll need to switch terminals or not. Of course, there’s a problem here. The MD-80s are rapidly retiring while more 737s and A321s are coming in all the time. So this can’t be sustainable. Jeff says that at some point, they’ll be forced to expand the Terminal A operation into Terminal C because of that. As of now, they’re using the low C gates as overflow if needed (which has been very rare), but that will just continue to grow. In a couple of years, when the MD-80s are all gone (*cry*) then it’ll be a fairly uniform operation. At that point, they’ll still likely try to isolate the A319s since they’ll require fewer people to work the departure. I’d assume the small fleet of A320s would group with them as well, if they’re in Dallas. But it won’t be nearly the issue it is now. How’s it been going? Well, Jeff says it’s too early to tell, but that it feels like a good move in the first week. (Jeff readily admits that “feeling” like a good move isn’t exactly a reliable metric.) Looking at on time performance doesn’t really tell us much. For September 21 through September 28, American’s on-time departures (D0) were up 7.7 points compared to September 1 through September 20. That sounds great, but American Eagle’s D0 was up 6.85 points and those saw no change to gating. In other words, results are inconclusive so far, but certainly there’s nothing bad about it from a reliability perspective. I like these kinds of moves, even if it only matters for the next couple of years. But every little thing like this can help improve the operational performance, and that’s extremely important. From the title, I thought I would get to see a rant about Terminal E and the complete cesspit has taken over there everywhere behind security. This is an interesting change for AA. Perhaps they will start moving MadDogs to DFW out of the other hubs as the 737s and A319s come on line to keep what they perceive as an operational advantage. I too was expecting a different article after seeing the headline and pic. Seems like AA is doing things that make sense operationally. While I don’t hate DFW and would take it over a connection at ORD, it is massive and not as easy to jump from terminal to terminal as compared to an ATL or DEN. Anything AA can do on their side short of rebuilding the place is welcome in my book. What about passengers? Is there a way to schedule gates to minimize passenger connecting time, for instance putting common connections close to each other? Good question. . . .I’ve always wondered how gates are scheduled, or lack thereof. 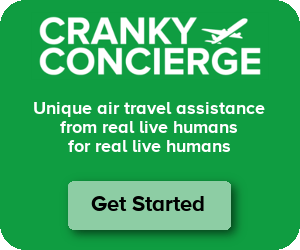 Perhaps an “Ask Cranky?” It seems in this case American has some plan. I wonder how other airlines do it. Ron – It’s too complex to try to gate people to make for easy connections. People generally fan out all over the place. What would be nice is if they could relocate a tight connection on the day of departure if there’s an unusually heavy load of connectors to a single flight. That’s hard to do though. Well, in a mid-country hub like DFW, one might guess that more passengers flow west-to-east and east-to-west than backtracking. Not all, of course, and there are also north-south, regional, and international connections, but if planes arriving from the west and departing to the east are bunched together, and separately from the planes arriving from the east and departing to the west, then I’d guess more passengers would have a close connection than with purely random gate allocation. If such an operation were maintained consistently, it could in theory translate to quantifiable efficiencies such as shorter minimum connection times for certain connections. Whether this is practical is another matter — the magnitude of such efficiencies might not justify the complexity of the operation. Planes don’t really flow in the way you’re imagining. A plane flying from LAX-DFW may very well turnaround and fly right back to LAX. You are right though that in certain competitive markets, the airline needs to do everything it can to keep scheduled layovers (and not necessarily MCTs) short. Some savvy travelers don’t want MCTs to get too low (and have the airline hold to them) because they know things that tight can lead to increased misconnections when things go bad. I think at one point, NW was down to a 25 minute MCT at MEM. Seriously? That connecting flight is boarding when my first flight blocks in. The slightest thing goes wrong, and I’m screwed. I like a 60-90 minute connection for domestic flights at a decent sized hub. I’m sure on paper it makes sense and mostly will work for them. A good bad weather day will be a test when things can get all mixed up. It will be interesting to see what happens with irregular operations. How will AA handle the situation if an MD80 can only park at C, and the only open gate is at D. Frequently (sometimes due to an early arrival, but usually an irregular operation day) there are gate holds. Several times flights I’ve been on have been waiting for a gate at one terminal, then taxi all the way around to the opposite side for another terminal. The gate hold time could increase if a specific aircraft can only park at a specific gate. Color outside the lines at AA. . . we shall see. PF – An MD-80 can park anywhere it’s needed. It needs less equipment and personnel than other aircraft. But if a 737 needs to park somewhere where there isn’t the right equipment and personnel, it can always be done. They just need to move people and machines over, takes time. So if all hell breaks loose, that will still work. What is happening with the US Gates that were in Term E? Is AA still using those? IF so, what aircraft are being used over there? They were as of Saturday, I saw an Airbus, was at a distance so not sure which type, other than a narrowbody. As of last Sunday when I drove by, it appears as if US is still firmly entrenched at E. All former US gates occupied by A320 series in US colors. D-ROCK – I have no update on that, but I assume it’s just a matter of time before they consolidate. When I spoke to the legacy US Airways folks at DFW last time I felw out of there it sounded like they would exit terminal E after the 17th from what I know. I can’t wait to get rid of the USAir App, annoying upgrade nuances (I rarely get upgraded on US Metal as an EXP) and terminal E at DFW which has no lounges. I’m wondering about the gate holds too. Since rebanking it seems that my flights have been involved more with the “cueing” of arriving aircraft. Taxiing around forever only to wound up in an area parked behind 4 other aircraft waiting for gate space. Will this new Terminal/AIrcraft Type procedure help? Seems to me it’ll will be worse. Reading your article I began to realize that what American is doing at DFW is so simple but so clever. Living in Greater Atlanta I use ATL fairly frequently but I don’t think Delta uses anything as simple and clever as what AA is doing at DFW. I don’t make connections at ATL, but for those I know who transfer through ATL it is generally a crap shoot as to where your plane will be, even if you know the type of plane it is. I’m curious how this will affect the passenger experience. If bigger planes are being sent to Terminal A and smaller ones to Terminal C, presumably you’ll see a shift in passenger volumes from C to A as well. That could equate to longer security lines and more crowding of lounges, gate areas, and restaurants. I believe they may be doing it this way because 2/3 of A is renovated, hence more security lanes, restaurants, etc. I believe that there are more seats at the gates as well. At least, up until recently the Hawaii 767s usually went out of a low C gate, don’t really see any other wide bodies there, not sure if that is still the case. Better yet, standardize narrow body aircraft type by hub – 737’s at Dallas, A320’s at Charlotte, etc. Provides lots of other benefits – reduce spare part inventory, jet bridges can be set to a standard position, flight crew and maintenance staffing simplified, etc. Before anyone throws rocks, obviously a long-term project but one worth exploring? I know until a few years ago, no MD-80s went out of MIA. It was always odd to see an AA hub without them. I thought AA already did this… like a decade ago. Million Miler – Every aircraft type serves a different purpose. The MD-80 has fewer seats. The A319 has even fewer but it has long legs so serves specific purposes. It’s hard to just have a single fleet type in each hub because you need the benefits each one brings. Overall I think this makes sense and, for passengers who pay attention to aircraft type, it will be helpful to better anticipate arrival and departure terminals. Nonetheless, it makes me sad to think of AA without the Mad Dogs. First class on a Mad Dog, while not particularly luxurious, is among the quietest and smoothest rides in the sky. This is an interesting change. Hopefully, this will work out for passengers and not just flight crews. I transfer through DFW frequently and I am looking forward to a possible improvement as long as I am aware of which aircrafts that I will be flying on. I wish to know how gates are scheduled generally? This actually seemed to work well for me a couple of weeks ago. Had a connection to Milwaukee on 9/22. Equipment was an MD-80. They put us on another MD-80 just a few gates down from the broken one. Watched the same ground crew unload the luggage from the problem plane, load on the new plane, we were gone only a few minutes late from our scheduled departure.